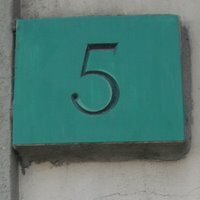 orinda5: To frog or not to frog? ...that is the question. I have been so conflicted about my Bellatrix socks [Ravelry]. This is take two for this yarn. I first tried this yarn as Monkeys [Ravelry] - but at the gauge I wanted, the colorway striped totally vertically down the leg. Is there a pattern out there that would be good for this colorway? Jaywalker has more stitches around at the same needle size (for me), but I don't know if I would actually be any happier. I had totally convinced myself to frog.... but now I am just letting them sit. Perhaps I will just finish them - enjoy the lovely soft, cooshy-ness of the yarn on my feet before it gets too warm, and move on to some semi-solid goodness in my stash. I was quite sad over my Spring Break a few weeks ago... I lost my "Java Beret" - the one I made with yarn I dyed with coffee. It fell out of my coat pocket and was picked up by someone within 5 minutes - I was on the scene just after it must've happened. This has been my go-to hat all winter. Such a simple pattern... but wonderfully simple. I liked it so much, that as it happens I made another one not too long ago - so luckily I did have a new go-to hat waiting in the wings. 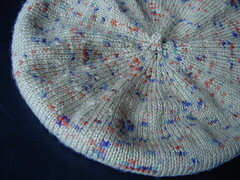 I hope that whoever has adopted my beloved Java Beret appreciates its hand-knit, hand-dyed goodness. Perhaps I will see it around town someday. I had been feeling like I had been sprinkled with some Black Fairy Dust (right around the loss of my Java Beret), so my cure was lots of Garter Stitch. I frogged my Dropped Stitch Scarf (another project that was not making me happy) and went for simple and mindless knitting: the classic garter stitch scarf [Ravelry]. 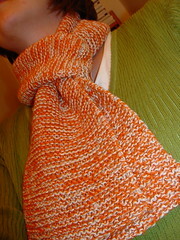 It's not super cuddly and smooshy, but it has great weight and drape. 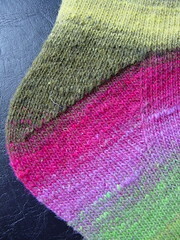 In other FO news: I finally finished my Noro Socks [Ravelry]. These were also mostly mindless knitting (just plain stockinette), but for some reason the last 1/2 a sock took me ages. But... Ahhh Noro - so worth all of the cursing I did while trying to wind it into two yarn cakes. It was like velcro on itself the entire time. I am so in love with how the colors transition into each other. It's too bad that they may not get much "foot time" until next fall. They feel like they are one of the warmer pairs I have made so far - and it is starting to get too warm for that around here. This pattern (Wendy's Toe-up with Gusset Heel) was a new heel for me. I will definitely use it again. It seemed to eliminate "holey" issues better than other heels - which I really liked. 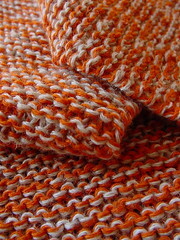 I would like to be able to insert it into other toe-up sock patterns I make - if I can wrap my head around the math of it. It may have just been my own confusion, but the stitch number pre-gusset and post heel is not the same - which I would need to work out if I were continuing a pattern up the leg of a sock. 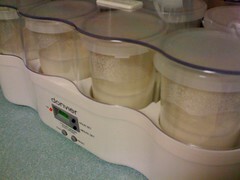 My birthday gift to myself arrived last week: a yogurt maker. My second batch is in the works right now. The first batch has already been eaten! My biggest motivation to make my own has been the stupid non-recyclable plastic containers for store bought yogurt... but homemade also tastes super yummy. Other fun around our house has been bringing my old doll house in from the garage. The Bud thought it was pretty cool even with it empty, but we got a new family and furniture for it yesterday afternoon (my old dolls and furniture are far too fragile for 2 year old play). I love the furniture we got - it is really well made and has many fun pieces. We only put out a few them, so that we can have some surprises every so often. I know there are a few people waiting for me to add to my etsy shop again. - it's still in my plans, just a little delayed. 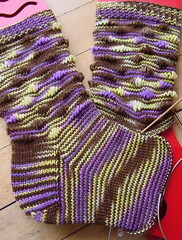 I quite like your Bellatrix socks - and they're more than half done - go ahead and finish them! 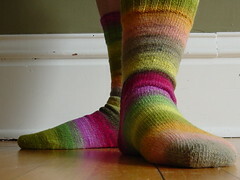 Also, love the Noro socks. Yum! Love the Noro socks and love the yoghurt - home made yog is my favourite breakfast. I wouldn't frog the socks, I really like them!! The colors and pattern work, IMHO. Finish them and enjoy them! 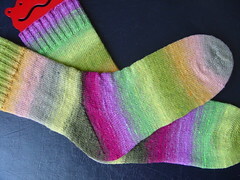 The Noro socks look great too. I will remember when winding into cakes that it will be an aggravation. I have yet to try a heel like yours. I like how it doesn't interrupt the colors.